Check us out on YELP for the newest testimonials! Negar represents the absolute best in Bay Area real estate. From the moment we met Negar, her depth of expertise and knowledge, dedication, professionalism and responsiveness astounded us. As other reviewers state on these pages, purchasing a home in the incredibly complex, competitive Berkeley/Oakland/East Bay real estate market requires you to have only the best agent representing you and we assure you that is what you'll get with Negar. She will perform in depth analysis of each home that is about to come on the market or has just come on the market for you with your unique checklist of likes and dislikes and provide you with the insider edge you need to acquire your dream home in this truly intense, perplexing market. Even during and subsequent to escrow, Negar is constantly available for questions and consults of any nature pertaining to a home including providing references for home services, etc. Needless to say, we were in a super competitive multi-offer situation and with Negar's expert guidance, ended up getting our dream home! Do not hesitate to place your trust in the hands of this truly expert, exceptional realtor! Negar helped me find my first home and made what I thought would be an extremely stressful process very straightforward, efficient, and simple. She found an unlisted property that was absolutely perfect for me and I got it at a great price. Negar was very organized and tech savvy, I'm very busy so being able to text and email with my realtor was crucial. I would highly recommend Negar to anyone looking for a home, you won't find a better agent! I can't highlight the value enough about working with a local agent(s)! Feri and Negar's expertise in East Bay allowed us to be as aggressive as our budget would allow, while still landing a home within our desired area! They guided us through our first time buying a home, making as painless as possible - closing in just 21 days! Feri and Negar are true partners in the house hunting process. Thank you for our dream home! We cannot recommend Negar highly enough. Negar is well known for her expertise in the local market and knows how to get offers accepted in the most competitive situations. We see Negar regularly go above and beyond to make sure her clients are well taken care of throughout the entire home buying process and extremely happy with their purchase. She is responsive, congenial, and professional. You will love working with Negar - we absolutely do! There are not enough words to express how grateful we are for Negar Souza! You could not possibly find a better agent on the planet! She is a true expert in her field and we could not have become homeowners without her. As first time homebuyers we had a millions questions and Negar was patient with all of them. The hunt for the perfect house spanned years and almost the entire Bay Area. We looked from Point Richmond, to Alameda, Albany to Livermore. She was always ready with at least 5 homes in any area we chose to explore. She had full details, insider information and comps for every home. If one didn't work she had another one lined up within hours. She was willing to hold our hand through submitting several offers and fought tooth and nail for us in this competitive market. Again, she is honestly the only reason we "won" our home and in the Bay Area if you are lucky enough to have your offer accepted you are a winner! She had also helped my mother find her home and later sell it WAY above asking with multiple offers. My mother has the same sentiments but just isn't very Yelp savvy ;-) 5 stars from her as well. If you need someone to work for you fast and efficiently she is your agent. The best of the best! Thank you Negar!!! I highly recommend Negar Souza if you are looking for a realtor. My family has had dramatically changing needs in location and type of home to purchase over the past 2 years. Negar patiently shifted to looking for whatever we needed. She made suggestions we hadn't thought of and helped us find the perfect home in this crazy market. Negar held my hand through closing and made sure everything got done smoothly and efficiently. She checked in after the sale to make sure everything was as it should be and helped me through working with PG&E and the seller's handyman. Negar is also a really positive and caring person and works really hard to get any job done. Having both bought and now sold with Negar and Feri, I can't stop singing their praises. As first time home-buyers, Negar walked us through each and every step with confidence and expertise. She's supportive, honest, realistic, and will go to bat for you. She's incredibly reachable, and gave us her full attention every step of the way. It's clear that she knows what she's doing in this business. Contractors, mortgage brokers, etc. love her and will go out of their way to make your experience smoother because of your connection with her. Now working with Negar and Feri on the selling side? Negar has a great sense of the market and was forthcoming, realistic, and honest about the our options as sellers. The more we work with Negar, the more I'm convinced that 1. I could never be a realtor. and 2. I'm super thankful that we found a badass realtor who gets things done and genuinely cares about the outcome. We started working with Negar in September and she was a very responsive realtor. She realized our needs, helping us discover what we really wanted; she gave us a push if needed but stepped back to let us make the final decision. She is very friendly, helpful and knowledgeable. Great communicator. She continues to support us after the purchase of the house. I've known Feri for decades and have complete trust in her honesty and integrity. I've done 4 separate transactions with both Feri and Negar and have only the highest regard for the deep knowledge, conscientiousness and quality judgement they bring to their craft. The last transaction was difficult and there are a lot of agents who would simply have failed to pull it off. Thanks to both of you! We recently purchased a home in Oakland and couldn't have done it without Negar and Feri. We worked mainly with Negar and she is so pleasant to work with. She made our experience both quick and enjoyable. Being first time home buyers, she lead us through the entire process with ease and makes herself available to her clients basically 24/7 - I really don't think she sleeps! She is always responsive and goes above and beyond to explain any questions we may have or offer information and advice. She was really our advocate the entire way and we are so grateful for that. She has a great rapport with all of the vendors she works with and, even after we were finalized, she still makes herself available for our questions and is happy to recommend vendors to us. We can't thank Negar enough! When my wife and I were ready to start exploring East Bay options (N. Berkeley & Albany) for a move from SF, we were so lucky to find Negar. She was extremely patient with us as we got in touch with her well before we were ready to start bidding on homes. She was always available for phone calls, in-person meetings, and emails whenever we had questions. When we were finally ready to start seriously considering homes, she guided us through the process with ease and made sure we got exactly what we were looking for. Negar is very responsive, explains everything clearly, and is super friendly to work with. Once our renovations are complete, we are looking forward to seeing her around town! We would highly recommend her and her team. Feri and Negar made a great team for us. They worked with us for over 8 months to put us into our first home in Oakland. They were always quick to respond and gave honest, helpful information. I would certainly recommend them to anyone seeking an agent in the east bay. In the process of finding and buying the perfect home for us, we worked with both Feri and Negar. Both were wonderful - very well informed and proactive in sharing their knowledge of the market and how to win in the competitive bidding process for a home. Negar intuitively found the right home for us to see and Feri made the bargaining suggestions that put us over the top. They're also both extremely nice people, professional and easy to deal with. I'd bought properties twice before so I've dealt with a real estate agent or two and I have to say Feri and Negar stand way above the crowd! Also I second what another reviewer said about how Feri encouraged us to consider renting our previous residence instead of selling. This has turned out to be a great thing for us and it surprised me at the time to hear an agent suggest it, since we would've gone with her had we decided to sell it. I highly recommend Feri and Negar without hestitation. Thanks to them for getting us in the house we love! I recently bought a condo and home in the East Bay and Negar was my agent. Buying a property in the Bay Area is a stressful experience because of the multiple bidders, older homes, and different school districts. Being a first time homebuyer doesn't help either. Luckily, Negar helped me through the entire process. I asked her a ton of questions via phone calls, email, and text (i.e. bugged the hell out of her) but she remained patient and passed down her knowledge of the Bay Area housing market. I also appreciated her valuable advice whenever I had to make an important decision. I felt like she was always looking out for my best interests, which is something really hard to come by these days. If you're going to buy or sell a home, make sure to give Negar a call. Are you kidding me? We literally would not have got this house if it were not for Negar. We are first time home buyers, and she walked us, no, carried us, through the entire process from locating the house to the day we received our keys. Let me first start by saying, she is incredibly knowledgable about the area. We already knew what city we wanted to live in, and we visited a bunch of places she found within budget with key features in mind. She knew which places were kid friendly, which had lots of traffic and noise issues, what kind of history the buildings had. When we visited a place that had some feature we liked or didn't like, she would remember them for future visits. Secondly, she is incredibly well connected. All the contacts we worked with all knew Negar on a very professional level, many of them bending over backwards to help us. Many of them did rush orders or come after hours, as a "favor to Negar". All the people we worked with were Negar's recommendations and all were amazing and knowledgeable. "She works for you" is such an understatement. All our showings were evenings and weekends. The current place we saw was on the market a few days before she called us and set up a viewing. She worked with our broker to get an offer in before the general public showing so we had the best chance. In the last days of our escrow, we ran into a sticky situation (our fault) and had to fast track our close. Negar managed the entire situation through countless phone calls and emails to each person (including a call to France where our broker was on vacation at the time), making sure each person did their task precisely on schedule. We really could not have gotten this place without her persistence and careful planning. THANK YOU! Negar and Feri made our first-time homebuying experience in a tough economy just about as good as it could be. They are knowledgeable about the entire Bay Area's real estate market, but especially tuned in to the East Bay. They knew everything about every neighborhood we were considering, and quickly understood our priorities. Both Negar and Feri made themselves available for the small windows of time our busy schedules mandated, and they never wasted our time on houses that were out of our price range or not to our taste. When we found our dream home, Negar hooked us up with a terrific mortgage firm, sorted out every issue with the seller's realtor, and sheparded us through the entire process with amazing skill, patience and gentleness. Her ability to speed-text and her turnaround response times via every imaginable form of technology are breathtaking! There aren't enough stars to express how impressed we are with Negar and Feri. Let's put it this way: They'll be our realtors forever, and we think you should consider making them yours. Negar Souza has been a wonderful agent to work with. She helped us through the arduous process of being first time homebuyers and her extensive knowledge of the East Bay housing market is remarkable! Negar will genuinely take all factors into consideration in order to find a home that fits your personal criteria. She is attentive to her clients' needs and goes above and beyond to answer the multitude of questions that comes with the home buying process. She guided us through every step of the way and actually minimized much of the confusion and stress of being first time homebuyers by being so efficient and knowledgeable. Now we're enjoying our home and hope other buyers will have a chance to work with Negar! "I recommend Feri Niroomand and Negar Souza to everyone I know. 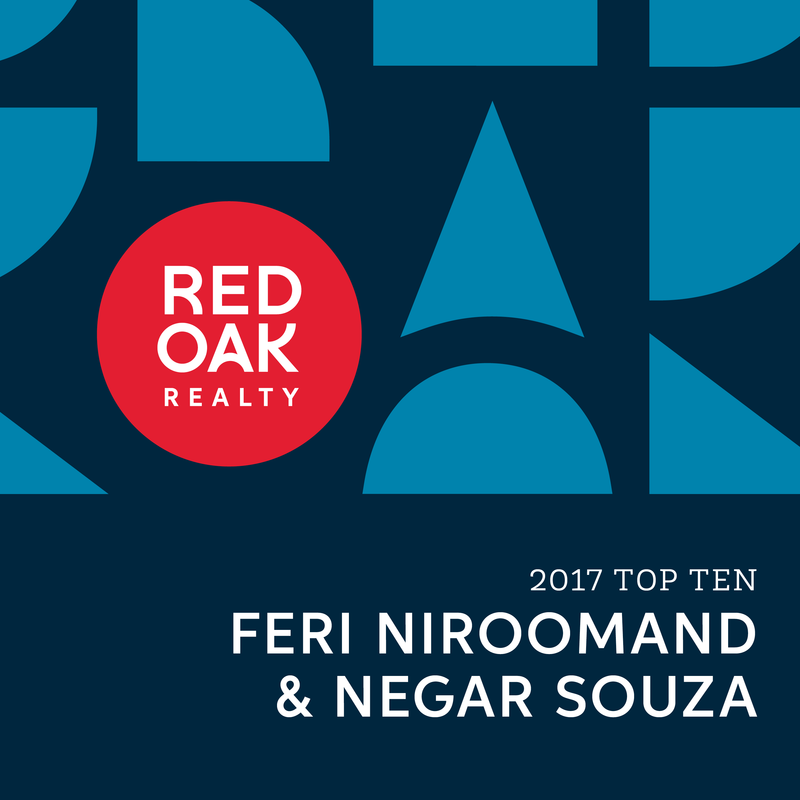 Feri and Negar know real estate, know the Bay Area inside out, are great negotiators, and follow up on every detail. From start to finish, the purchase of my home was one simple step after another. No hitches, no stress, no delays. I was kept informed as each step was completed, escrow closed and I picked up my keys! It was a perfect experience and they are lovely, lovely people. "Feri and Negar recently represented me in the sale of my home. They are consummate professionals--great advice about every aspect of preparing my home for sale. They take care of all the details, from staging the home, to arranging for beautiful photography for marketing, to pre-sale cleaning and touch up painting that was necessary. My home was on the market for only one week, and it sold for over the asking price. I couldn't have been happier with how they handled the sale of my home." I valued the care and attention that Negar and Feri placed on the sale of my home from preparation to closing. During a hectic process I was provided with the attention and professionalism that was needed to successfully sell my home to the perfect buyer. Feri was always there for us during the difficult and tedious process of selling our house. We were able to sell our house in less than two weeks at a price over asking. Negar and Feri were wonderful! We had a short time frame and a lot of undecided details when we were looking to buy a home. Negar and Feri had boundless energy and patience, and were very honest and thorough as they walked us through each option and each step to complete our purchase. Their support made not only the purchase of the new home possible, but also provided stability and sanity to the whole process. Let me emphasize just how helpful and honest Negar and Feri have been. Even when they would have benefited from steering us in one direction, they advised us against anything they didn't feel was in our best interest. I would recommend them to my family and closest friends without reservation. I love my house more all the time. What can I say? You worked a miracle, as you know. I have extremely high standards, and I give Feri Niroomand my highest recommendation without qualification for her services as a realtor. I tried 3 other top realtors in the EastBay over several years, and none met even my basic needs. Finally, Feri was recommended by a friend who had bought and sold multiple houses through her. Feri proved to be exactly as described: extremely knowledgeable and professional and very detail oriented. From start to finish, Feri was attentive to every detail: really listening and identifying my unique house needs/wishes; locating and taking me all over every week to see good options; ruling out inappropriate options in advance to save time; finding a great house, then hiring all the best inspectors to unearth any and all (obvious and hidden) problems with the house I had chosen; negotiating hard on the basis of that detailed information to get the price knocked down fairly to address any problems identified (so I would not have any surprises and have to pay more later); recommending the top service people - in terms of quality and price - to fix every detail at fair prices; ethically helping to address any problems that came up with the seller, seller's realtor, and service people - always in my best interests & well after the sale/remodeling; to make sure I would be HAPPY in my new house, and with all ensuing fixes and remodels. I simply cannot imagine a single other realtor in this market with this level of genuine interest in her customers: getting the best house for them, at a fair price, and in its best shape, even including remodeling recommendations and problems. Feri is also a wonderful and thoughtful person, someone I now think of as a friend. She is a very interesting person even outside her profession. I hold her in the highest professional and personal regard. I would never buy or sell a house without her, and I recommend her 100% to ANYONE who wants to buy or sell a house. Lastly, it is worth saying that the manager and support staff at Red Oak Realty similarly impressed me with their attention to detail, knowledge and professionalism, and ethics/integrity. It is my honest view that a buyer/seller could not go wrong in Feri's/Red Oak Realty's hands. My Wife and I did not even think buying a house was remotely possible. Negar and Feri turned our fantasy dream into an immediate reality. They took care of everything and made all the complications in buying a home seem relatively easy. They were very helpful and personable when we were looking for that perfect home and only took us out to preview homes that were the right fits for us. This helped save us time so we didnt look at homes that we would not be interested in. They also were very familiar with the particular areas that we were interested in moving and didnt try and stick us in bad neighborhoods/busy streets. They were very proactive and got all the documentation/disclosures on homes and always offered their expertise on expansion, future value increase, and an overall professional opinion of the home. They went out of their way to make the whole process easy. They came to our house when we needed to sign documents, since we had a newborn baby. They got the escrow papers transferred to an office closer to us so we didnt have to travel far with our newborn baby. They also even paid for our home appliance warranty when the home seller refused to do so themselves. They even helped us get the for sale sign taken down when the seller was very slow to get rid of it. I want to express my deep thanks and appreciation for your hard work in helping me get my house. It was a real pleasure to work with you  I feel I could not have done better in choosing an agent. I do appreciate the efforts you made and the work you did to sell the Albany houses in such a timely manner  despite the new issues that kept appearing. Beyond that, I thank you deeply for the manner in which you did so: with grace, humour, determination, and a willingness to hear what was important to me.